When it comes to development success stories it’s hard to look past Vietnam. After shrugging off the colonialist French it withstood saturation bombing by the USA before pushing back the Chinese. The political and economic (Đổi Mới) reforms towards building a socialist-oriented market economy initiated at the 6th National Congress have seen the country grow to become the hi-technology manufacturing hub of Asean (See: Vietnam’s High-Tech Hub: More Than Just Silicon Dreams). While neighbouring Thailand builds washing machines, automobiles and hard disk drives, Vietnam’s younger and higher skilled workforce churns out mobile phones, tablet PCs, and computer chips. Since 1990 Vietnam’s per capita GDP has been among the fastest in the world, averaging 5.5 per cent a year since 1990, and 6.4 per cent per year in the 2000s. In 2015 Vietnam GDP increased by 6.7 per cent, compared to just 2.8 per cent in the much longer industrialised Thailand. Socially conditions have also improved. According to the World Bank the fraction of people living in extreme poverty dropped from more than 50 per cent in the early 1990s to 3 per cent today. Access to basic infrastructure has also improved substantially. Electricity is now available to most households while more than 75 per cent of the population has access to clean water and modern sanitation. This compared with less than 50 per cent of all households in 1993. However, Vietnam also faces unfinished economic modernisation and structural transformation. With almost a half of the Vietnam labor force still employed in the agriculture sector the potential to unlock significant gains in productivity and income growth as a result is substantial. While the World Bank notes that the Vietnamese population is better educated and has a higher life expectancy than most countries with a similar per capita income, it is the last point that is starting to ring alarm bells. 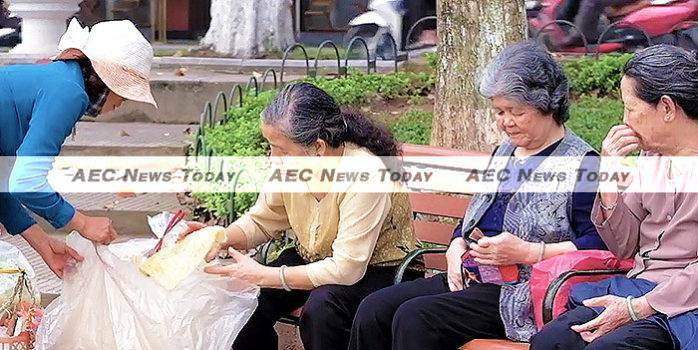 With only about 20 per cent of Vietnam elderly in receipt of a pension – a meager US$ 4-8 (VND89,000–VND178,000) per month compared with minimum monthly wages of between $101 and $146 (VND2.15 million–VND3.1 million) a month – the government is trying to find ways to improve its pension, and healthcare systems, while also improving the Vietnam labor market. According to the Bank ‘the region is at a crossroads. While older people have generally benefited from the region’s economic growth and significant poverty reduction, poverty rates tend to increase more with age in countries such as China, Indonesia and Vietnam. Poverty is also more common among the less-educated elderly, and those with fewer adult children to depend upon or with limited social security benefits’, it says. In its, Live Long and Prosper: Aging in East Asia and Pacific, the World Bank notes that people of all ages in East Asia expect that the state will play a bigger role in supporting them in their old age. How those expectation are met will be a key social and political challenge in coming years. In the above video Mr O’Keefe outlines some of the measures needed for Vietnam to adequately manage its ageing population, along with the social issues at play.